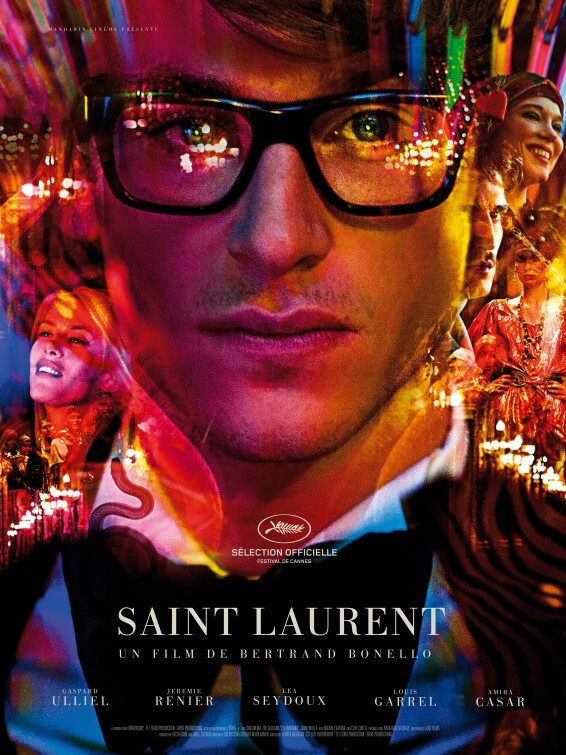 Director Bertand Bonello’s epic portrait of the life of influential fashion Designer Yves Saint Laurent is beautifully if not explicitly captured in his amazing biopic Saint Laurent, starring the gorgeous Gaspard Ulliel as the iconic and tortured designer. Belgian actor Jeremie Renier (In Bruges) stars as the French industrialist Pierre Berge whom together with Saint Laurent founded the hugely successful and influential Parisian Fashion House Yves Saint Laurent YSL, making it an international, synonymous with style and sophistication. Bonello’s Saint Laurent not as brilliantly done as Olivier Dahan’s Oscar winning La Vie en Rose about the life of Edith Piaf, but just as lush and gorgeous simply making the entire film a tribute to Proust, the French novelist and celebrated aesthete who influenced the extraordinarily talented designer Yves Saint Laurent. Choosing not to show YSL from his early years in Algeria or his time briefly spent in the French army, but rather focusing on the crucial years of his artistic flourishing between 1967 and 1976, where together with Berge he transformed women’s fashion and the two of them whilst being lovers also were integral in establishing a hugely profitable international fashion label. Industrialist Pierre Berge was the business brains behind the venture while YSL was clearly the creative force whose own inner demons led him into a debauched life of drugs, orgies and extravagant co-dependence. Yves Saint Laurent love affair with the notoriously promiscuous Jacques de Bascher who embraced the 1970’s sexual revolution and rise of gay expression, post Stonewall in Paris and New York. They were frequently seen at famous Parisian nightclubs and indulged in a decadent relationship which was eventually doomed to failure, as YSL’s drug and alcohol excesses were threatening his distinctive creativity. Jacques the epitome of a gay 1970’s dilettante, wonderfully played by Louis Garrel from the provocative Bernardo Bertolucci film The Dreamers is perfectly cast in this role. Seductive, dangerous and certainly a bad influence, Garrel portrays Jacques as a male version of a femme fatale. Berge intervenes and rescues YSL from this dangerous courtship and soon re-establishes their dominance in haute couture in 1970’s Paris. YSL was famous for dressing such stars as Catherine Deneuve and opera singer Maria Callas. 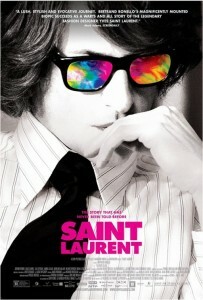 Clearly influenced by Martin Scorsese, Bonello’s two and a half hour Saint Laurent is a drug fuelled, sexual and gorgeous portrayal of one of the 20th century’s most famous fashion designers who subverted traditional gender roles with the introduction of the feminine two piece pant suit complete with fabulous accessories and sparkling cobra shaped belts. Yves Saint Laurent own obsession with 19th century French novelist Marcel Proust and his tremendous love of the aesthetic is defined as the continuing fight for elegance. Dividing his time between his villa in Marrakech and his lavish apartment in Paris as well his jetset appearances in New York, the portrait of YSL is of a true creative genius, eccentric, tortured and revolutionary. Bonello’s chooses to frame Saint Laurent in his later years in the 1980’s as he leads a reclusive life in Paris in between splicing shots of the rapturous 1976 Haute Couture Fashion Show at the Paris Atelier which YSL become so famous for. Saint Laurent is a gorgeous film, beautifully portrayed by all in the cast including upcoming actress Lea Seydoux (The Grand Budapest Hotel, Midnight in Paris) as Loulou and indie actor Brady Corbet (Mysterious Skin) as the American representative for YSL. Capturing the fragility and creativity of YSL, Gaspard Ulliel by his looks alone carries the role for the entire two and a half hour film but audiences should be warned that besides the subtitles, certain sexual scenes may be disturbing to the uninformed. As biopics go, Saint Laurent is not a perfect film, slightly indulgent, beautifully shot and at times like watching Tom Ford’s A Single Man on an extended acid trip. Recommended viewing for those that enjoy a strenuous French film about that nation’s most influential fashion designers and more importantly the business of Fashion itself. Best line in the film: “You can’t name a perfume Opium”.